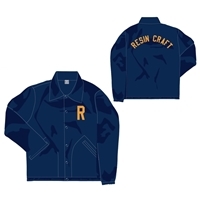 The Original Resin Craft Shop Items. Shop RC TEE. Water base Print on American Apparel Poly-Cotton Jersey. Poly-Cotton (50% Polyester / 50% Cotton) construction (Heather Grey contains 10% Polyester) Durable rib neckband. Shop collaboration with Dave Hanson. Water base Print on American Apparel Poly-Cotton Jersey. Soft and lightweight in our Poly-Cotton blend. Poly-Cotton (50% Polyester / 50% Cotton) construction. Durable rib neckband. Raglan 3/4 sleeves. Collaboration Coach Jacket with Ebbets Filelds Flannels from Seattle,Washington.